Use either the pulldown below or click on the icons to the left to see a larger image. An English magazine published in Antigua Guatemala for the large international community of both foreign residents and Spanish students. 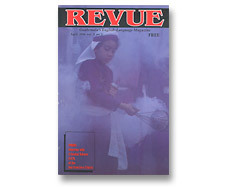 Loris photographed several magazine covers for Revue in the 1994-96 period when art-i-zen.com was operating in Guatemala. You may use either the pulldown menu to the right or click on the icons below to see a larger image of the last five photo covers that were published before Loris left Guatemala to move to the San Francisco Bay area and launch art-i-zen.com.